Menubar app for connection to RDP sessions. Is there a better alternative to RDP Launcher? Is RDP Launcher really the best app in Network category? 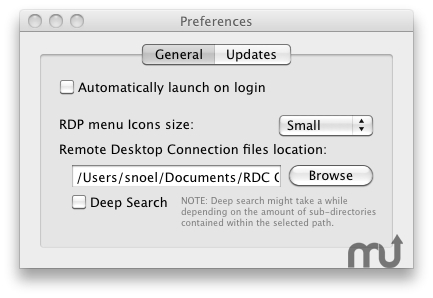 Will RDP Launcher work good on macOS 10.13.4? RDP Launcher was born from the need to connect to Remote desktops quickly, well, actually born from the click happy lazyness. Also because some of our Bonjour Mounter users asked us for this type of feature to be added into Bonjour Mounter, so we came up with this nice little menubar application that scans a folder for the presence of RDP files and displays them in a quick and easy to access menu. Please note that you will need the Microsoft Remote Desktop client installed on your Mac to enjoy the benefits or RDP Launcher. RDP Launcher needs a review. Be the first to review this app and get the discussion started! RDP Launcher needs a rating. Be the first to rate this app and get the discussion started! We plan to expand RDP Launcher to launch all sorts of remote desktop solutions in the future, depending on user requests. So give us your feedback!